We’re in the final days of the Write 31 Days challenge. While at first I was concerned I wouldn’t have enough to fill 31 entries, now I am scrambling to cover the topics I outlined. With four days remaining, it’s time to talk about the fifth and final of our senses, our sense of touch. Thanks to WebMD, we know that our skin is the largest of the body’s organs, “with a total area of about 20 square feet.” Despite this fact reminding me of the grossness of Silence of Lambs (my worst movie choice ever—that’s a story in itself, which I’d be happy to share), it is fascinating that our bodies are essentially wrapped in giant receptors. Our skin tells us a lot about the world we move about it: temperature (external and internal), potential dangers, the nearness of loved ones, and the like. Without a sense of touch, our life would be greatly hindered if not cut short. Who knows how long this man had suffered, how the disease had ravaged his body, what sort of shame he had endured. He comes to Jesus, kneeling, begging for help. Interesting that his request was to be made clean—the unclean label was the reason he could not be in fellowship with others, why he was denied closeness with family and friends. Jesus was moved with pity for his pain, so He reached out to touch the man. How long had it been since someone had lovingly reached out to him? How long since this man had sensed the touch of kindness and warmth and care? Our sense of touch is essential to our physical health, but also to our emotional and mental health. And so a proper sense of feeling in the world is essential. We speak about feeling spiritual things too—our souls serve as spiritual receptors, picking up on God’s nearness and care, identifying things unseen. 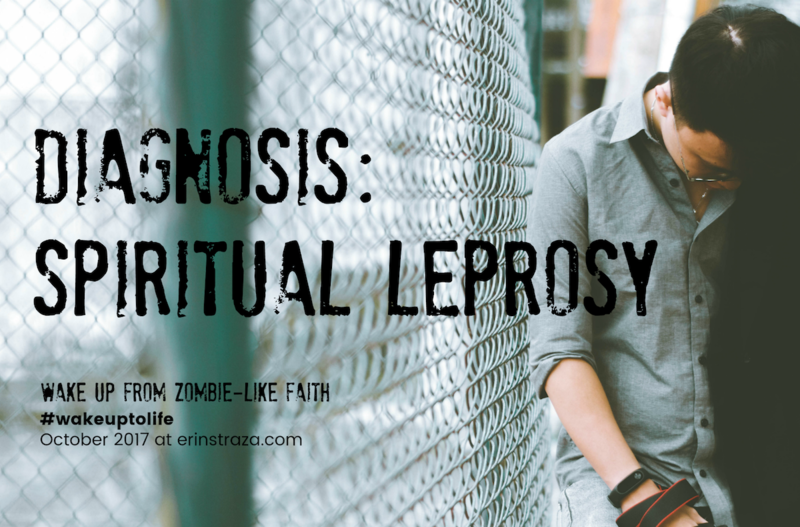 But what if we contract spiritual leprosy? What if we can no longer sense our surroundings? I’m guessing the ramifications are similar: we slowly become detached from all fellowship with God and others… we become isolated and alone… we suffer. I’m guessing that sort of existence looks a lot like the life of a zombie.